What changes will make 2019 Toyota Rav4 different? Everything. Toyota launches a fully redesigned version of its wildly popular compact crossover SUV for model-year 2019. The fifth-generation RAV4 premiered in static displays at the 2018 New York International Auto Show in March and goes on sale in December. It’s slightly larger than its 2013-2018 predecessor and has a new underskin structure, revised styling, better in-car connectivity, and an updated suite of driver-assistance features. Toyota practically invented the compact-class crossover when it launched the original Recreational Activity Vehicle with 4-Wheel Drive (RAV4) in 1994. Instead of truck-type body-on-frame construction it used lighter-weight car-type unibody engineering – the definition of a crossover. It didn’t have a true four-wheel-drive (4WD) system, either, but rather the more pavement-oriented all-wheel drive (AWD) that came to characterize virtually all modern crossovers. The ahead-of-its-time RAV4’s was an influential hit around the world and today, it’s more popular than ever. Sales have doubled over the fourth generation’s lifetime, exceeding 400,000 in the U.S. for calendar 2017 and on pace for about 386,000 in its final year. That places it ahead of rivals like the Honda CR-V, Chevrolet Equinox, Ford Escape, and Jeep Cherokee. The RAV4 in fact has displaced the Camry sedan as Toyota’s top-selling vehicle and is likely No. 1 in the compact-crossover class, too. On paper, RAV4 sales trail only those of the Nissan Rogue in the segment. But in reporting Rogue sales numbers, Nissan includes those of the Rogue Sport subcompact crossover, muddying whether Rogue or RAV4 is actually No. 1 in the class. To get a benchmark compact crossover with the very latest styling and features. The redesigned RAV4 will debut with two powertrains, a conventional four-cylinder gasoline engine followed in a couple months by a gas-electric hybrid. Toyota says the new structure is 57 percent more rigid than its predecessor’s and that a new suspension design promises a better balance between ride comfort — a RAV4 hallmark — and handling – a RAV4 shortcoming. The 2019 edition will mark the debut of Toyota Safety Sense 2.0 (TSS 2.0), an updated suite of driver-assistance features that includes autonomous emergency braking; it’ll be standard on every ’19 RAV4. The full model-grade structure was not released in time for this report but expect it to mirror that of the outgoing crossover. Both gas and hybrid versions of the ’19 RAV4 should come in base LE, volume-selling XLE, and sporty SE trim. The off-road-themed Adventure should return as a gas-only model, while the Hybrid will offer an even sportier grade called the XSE. Limited-trim versions of both the gas and hybrid models will reprise their roles as flagship RAV4 grades after having been supplanted by the Platinum grade for 2017 and 2018. If you can get one at a knockdown price as dealers clear showroom space for the all-new ‘19s. The redesigned RAV4 almost certainly will cost more, but unfortunately, strong demand suggests the current model won’t be heavily discounted until there are just a few remaining in dealer inventories. The outgoing RAV is roomy and comfortable and comes with a laudably array of safety features. But it’s not particularly rewarding to drive. Toyota seems committed to boosting driving engagement across its vehicle line, as evidenced by the redesigned 2018 Camry. So we’re hopeful the next RAV4 will match class standouts like the CR-V and Mazda CX-5 for road manners. Yes, radically so, although the auto-show unveiling revealed some derivative elements. The 2019 RAV4’s headlights and front fenders, for example, seem a blend of those on Toyota’s subcompact C-HR crossover and its midsize 4Runner SUV. The flared wheel arches and rear three-quarter sections appear to have been inspired by the Jeep Compass. Overall, it’s clear Toyota wants the redesigned RAV4’s exterior styling to reflect a new emphasis on sporty youthfulness. As for dimensions, full specifications were not released in time for this review, but compared to the 2013-2018 model, the 2019 RAV4 is 0.2 inches shorter overall, 0.4 inches wider, and rides a wheelbase (the distance between the front and rear axles) 1.2 inches longer. This should improve passenger and cargo volume, enhancing what’s already a RAV4 selling point. 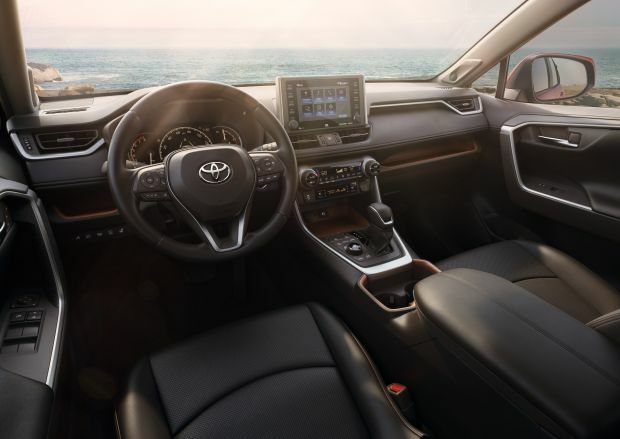 Inside, the 2019 RAV4 partially emulates the CR-V, with a modern instrument cluster and a central infotainment touchscreen mounted tablet-like atop the dashboard. Toyota loyalists may find the design off-putting at first, but it’s the trend. Limited grades will include a 7-inch multi-information display in the gauge cluster and will have a rearview mirror that incorporates a wide-angle camera view to give drivers an unobstructed picture of what’s behind the vehicle. Expect cargo capacity similar to the outgoing crossover’s outstanding 38 cubic feet behind the rear seat and 73 with the rear seatbacks folded. For the hybrid model, engineers repositioned the battery pack, eliminating a hump on the cargo floor and expanding cargo volume to equal that of the gas-only model. Yes, starting with that all-important underskin structure. The 2019 RAV4 adopts a version of Toyota’s New Global Architecture (TNGA), which underpins the automaker’s Prius, Camry, and Avalon. Front-wheel drive will again be standard on gas-only models, but this is the first TNGA vehicle available with AWD. It’ll be optional on the gas-only models and standard on the hybrid. A 2.5-liter four-cylinder returns as the only engine for gas-only models. It gets updated internal components, though, and should deliver about 15 percent more horsepower and torque than the outgoing RAV4; look for about 200 horsepower and 190 pound-feet of torque. Gas only models will again come only with an automatic transmission, but it’s a new eight-speed automatic in place of a six-speed automatic. The hybrid will also retain a version of the 2.5-liter four-cylinder and again combine it with electric-motor power for slightly more net horsepower and torque than the gas-only RAV4. It’ll use a second electric motor at the rear axle to provide AWD as needed. This is not a plug-in hybrid, instead tapping energy captured during braking and coasting to recharge the onboard battery pack. The hybrid’s sole transmission will remain a continuously variable automatic (CVT). The RAV4 will retain its all-independent suspension, though Toyota promises a new multi-link rear suspension will deliver improved handling without compromising ride quality. And it’s pitching the XSE Hybrid as the sporty flagship of the fifth-generation RAV4, combining its added hybrid power with a handling-tuned suspension that has firmer shock absorbers than any other RAV4 grade. 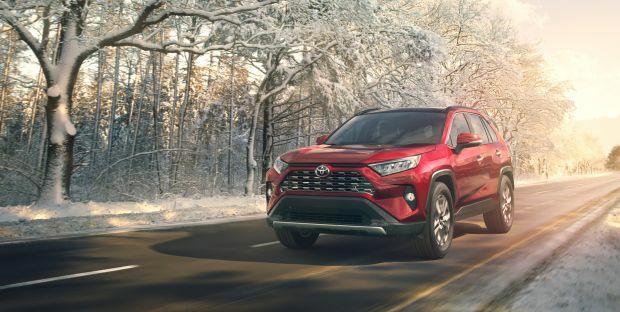 Adventure and Limited models equipped with AWD receive Toyota’s new Dynamic Torque Vectoring, which can distribute torque to individual rear wheels to improve on-road handling. The system is also capable of stopping the driveshaft from turning in situations where the onboard computer determines AWD isn’t required. This reduces energy consumption and rotational vibration, which should improve fuel economy and cabin isolation. Almost certainly. EPA ratings for gas-only versions of the outgoing RAV4 are slightly below the class average. The 2019 model should do better: figure ratings of around 26/33/29 mpg city/highway/combined with front-wheel drive and 25/32/27 with AWD. Hybrid fuel-economy ratings should also improve. Expect EPA ratings of around 33/36/34 mpg city/highway/combined. The outgoing RAV4 Hybrid was rated 34/32/30. All RAV4 models would continue to use regular-grade 87-octane gasoline. Yes. 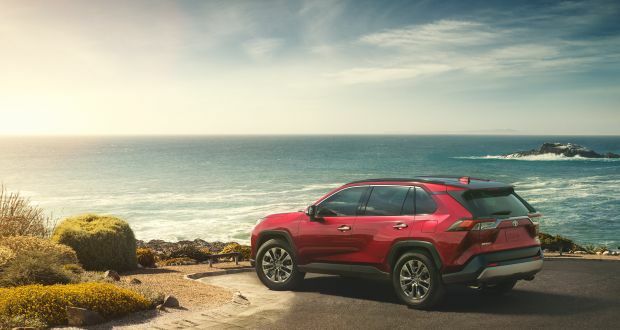 Toyota provided only a limited description of the redesigned RAV4’s standard and optional equipment but confirmed that TSS 2.0 will be standard across the board. The suite of driver aids consists of forward collision warning and autonomous emergency braking that can automatically stop the crossover to mitigate a frontal collision with another vehicle, object, or pedestrian. TSS 2.0 also includes adaptive cruise control with stop-and-go capability in heavy traffic, plus automatic highbeam headlight control. It enhances lane-departure warning with new-for-2019 lane-maintaining automatic steering correction and traffic sign detection. Also new is Toyota’s Lane Tracing Assist, designed to help keep the RAV4 centered in its lane even if yellow or white markings are unavailable or obstructed by a preceding vehicle. Other available safety technologies will include blind-spot and rear cross-traffic detection, plus rear-cross-traffic automatic braking and a bird’s-eye-view camera. LED headlights will be standard on the Hybrid XLE and above. The XSE Hybrid has unique exterior styling that includes piano-black accents. Limited grades will include a standard power sunroof, driver-seat memory, and the camera display within the rearview mirror. All 2019 RAV4s will come with Toyota’s new Entune 3.0 infotainment system, which adds built-in Wi-Fi hotspot capability and support for Amazon Alexa and, at long last, Apple CarPlay and Google Android Auto. Touchscreen sizes, depending on model selection, are 7 or 8 inches. The available JBL-brand audio system sees an upgrade to 800 watts and 11 speakers. It includes proprietary “Clari-Fi” technology that dynamically enhances lower-quality audio signals (those compressed for streaming, for example) to emulate the original source recording. Expect XLE and higher models to come with dual-zone automatic climate control. The SE and above should add heated front seats. Imbedded GPS navigation would be standard or optional, depending on trim level. They’ll almost certainly increase. RAV4 was already one of the pricier crossovers, with a 2018 base-price range of $25,705-$37,445, including Toyota’s $1,045 fee. Including the destination fee, the 2019 RAV4 will likely start around $26,250 for a front-drive LE and top out around $37,000 for a fully loaded AWD Limited Hybrid. At about $30,000-$31,000, the conventional XLE with AWD should again prove the most popular choice. Release date is December 2018 for the gas-only 2019 RAV4 and February 2019 for the ’19 RAV4 Hybrid. Until we have a chance to test the redesigned RAV4, our main suggestion would be lower starting prices. Today, the Honda CR-V just about matches the RAV4 for passenger and cargo room while handily beating it for road manners, all while costing the same or less when comparably equipped. Note, though, that Toyota include 2 years or 25,000 miles of complimentary scheduled maintenance, which Honda does not.